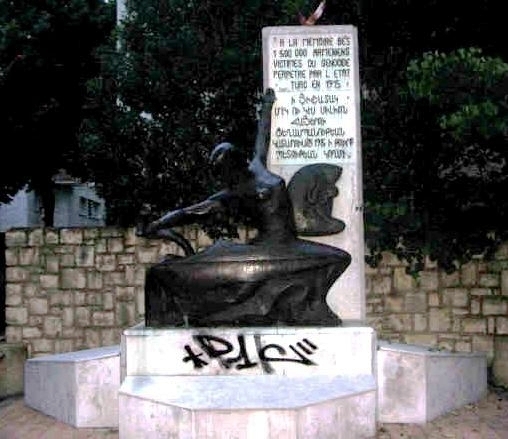 The Memorial to the Armenians Genocide victims was desecrated in Valence, France, on May 15  night. 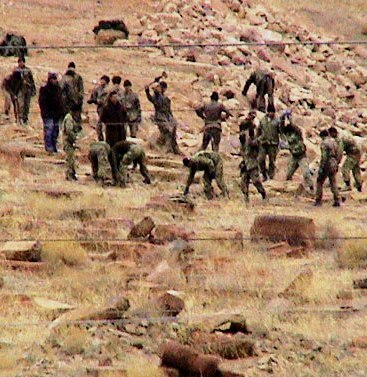 The vandals painted an illegible inscription on the monument base, independent French journalist Jean Eckian told PanARMENIAN.Net. The Coordination Council of the French Armenian Organizations from Drome-Ardeche area’s (COADA) deposited a complaint to the Police office of Valence. 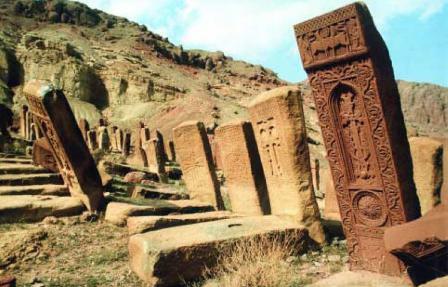 7 Armenian memorials – in Saint-Chamond, Creteil, Lyon, Valence (France), Cardiff (UK), Budapest (Hungary) and Lviv (Ukraine) – have been desecrated since January 2008. In four human rights resolutions adopted at the end of this week’s Strasbourg session, MEPs deplored the violence used by the authorities against opposition demonstrators following presidential elections in both Armenia and Russia, and demanded reprieves for a journalist condemned to death in Afghanistan and for a gay Iranian who could be in grave danger if forced to return to his home country. In the wake of the presidential elections in Armenia on 19 February, a police crackdown against opposition supporters who were peacefully contesting the results left eight dead and dozens injured. A state of emergency was declared on 1 March and media freedom has been restricted. Parliament’s resolution, adopted by 60 votes to 1 with 2 abstentions, deplores the loss of life, urges all parties to act responsibly and calls on the authorities to investigate the violence and take other measures. The International Election Observation Mission stated that the elections were “administered mostly in line with OSCE and Council of Europe commitments and standards” but also identified a number of concerns, in particular concerning the media’s commitment to providing impartial information. In the resolution, Parliament “expresses its concern at recent developments in Armenia” and “calls on all parties to show openness and restraint, to tone down statements and to engage in a constructive and fruitful dialogue aimed at supporting and consolidating the country’s democratic institutions”. It also calls “for a prompt, thorough, transparent, independent and impartial investigation of the events of 1 March” and “for all those responsible to be brought to justice and punished for misconduct and criminal acts of violence”. The Council and Commission should offer EU assistance to help with the investigation. The Armenian authorities are asked to lift the state of emergency, restore media freedom and take all measures necessary to ensure a return to normalcy. In addition, they are urged “to release citizens detained for exercising their right of peaceful assembly”. Parliament points out that the EU’s Action Plan with Armenia under the European Neighbourhood Policy covers the strengthening of democratic structures and the rule of law. In this context, it urges the Commission “to focus its assistance to Armenia on the independence of the judiciary and the training of police and security forces” and calls on the Armenian authorities “to implement swiftly all the remaining recommendations made by the International Election Observation Mission”. MEPs urge the Armenian authorities “to cooperate fully with the international community on finding an agreed solution” and they express support for the EU Special Representative to the South Caucasus and the OSCE’s Special Envoy. Turning to Armenia’s conflict with neighbouring Azerbaijan over the status of Nagorno-Karabakh, the resolution “deplores the recent loss of life on the ‘line of control’ during fighting between Armenian and Azerbaijani forces” and “calls on all sides to refrain from further violence and to return to the negotiating table”. Lastly, MEPs reiterate “the clear EU commitment to building closer ties with Armenia and the South Caucasus countries” but emphasise that “closer cooperation with the European Union must be based on real and tangible progress and reforms and a full commitment to democracy and the rule of law”. During a visit to Germany Turkish Prime Minister Recep Tayyid Erdogan has denied the deliberate annihilation of late Ottoman Turkey’s Armenian population stating that it is not in Turkish culture to commit genocide. Turkish PM Recep Tayyip Erdogan said [in Munich] on Saturday there was no such thing like genocide in Turkish culture and civilization. Erdogan replied to questions on several matters after his speech at the 44th Munich Conference on Security Policy in Germany. Erdogan’s racist explanation for his government’s denial of the Armenian genocide must have raised eyebrows in Germany since the statement suggests that committing genocide is in the perpetrator’s group culture and civilization. Bloomberg also reports Erdogan’s denial of the Armenian genocide but doesn’t reference the Turkish PM’s reference to culture. Asked about the massacre of Armenians in Turkey in 1915, Erdogan said Armenia should open its archives on the period. ”There was no genocide and there is no way we can accept this,” Erdogan said, adding that declarations of some western parliaments that the killing of Armenians had been a genocide ”is not acceptable.” The parliaments of France and a number of other countries have passed resolutions declaring the Armenian massacres were genocide. Ironically, the automated Google ad on the TurkishPress.com page on Erdogan’s nationalist comments links to the DNA Ancestry Project. Perhaps Mr. Erdogan should form an international commission to prove that it is not in Turkish DNA to commit genocide. So, Mr. Erdogan, if you consider Turks human (and you should) then they are, too, capable of genocide. 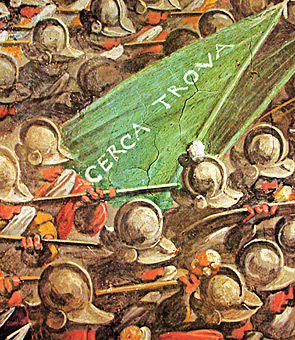 TIME magazine has posted an entry on February 2, 2007, telling of a five-century-old fresco by Giorgio Vasari that some Italian researchers believe is the code to the location of a long-lost Leonardo da Vinci painting. He was making a reference to my question in which I had asked which U.S. president would not brash his teeth when he was a kid. It leads to the discussion of Washington’s fake teeth and big chin, which is clearly seen in the Capitol rose onyx stone. There was another reason that the kid thought Mr. Simon had just solved the Da Vinci Code. Right next to George Washington’s “picture,” there is a picture of a turkey (the bird), which is “running” after George Washington because the latter did not select turkey as the national bird of America. Since I cannot locate a photograph of Da Vinci’s coloradode, aka the running turkey after big-chin George Washington, I decided to post a photo of another code (*caugh*) found in the State Capitol. Pictured is Amanda and cerca trova. Time Magazine’s European edition has made a surprising move by spending its own dollars to distribute a free documentary on the Armenian Genocide. This was, perhaps, done to avoid anti-racist and genocide/holocaust denialist laws in Europe and also, as Artyom of iArarat has mentioned, to correct their mistake. In June of 2005, the European edition of Time magazine distributed thousands of free copies of a supposed Turkish advertisement that included a documentary denying the Armenian genocide. Outrage around the world seemed to bring nothing at first. So what was the letter that had cought the attention? – According to the Courier, my reference to making Nazi flags. with the Turkish deniers of the Armenian Genocide. Are you ever going to respond to my letters? Europe as a free speech, correct? different from what we had to been led to believe they would be. Talaat introduced genocide by killing Armenians, you are introducing genocidel denial by spreading Turkish propaganda, I wrote. Later Time (European edition) published full-page statements that condemned the sponsorship of the denialist campaign. I nominate Turkish novelist Orhan Pamuk. He has acknowledged his homeland’s genocide against the Armenians and nearly got himself arrested before the Turks decided their commitment to and pride in their greatest writer exceeded a commitment to killers who died almost a century ago. It could bring a cultural change. Also George Clooney, for the obvious reasons, and the students who led the divestment movement on campuses for Darfur. Time did the right thing, and it is time for Google to do the same. As of February 2, 2007, Google lists www.ermenisorunu.gen.tr (a website denying the Armenian genocide) as a Google sponsor when “Armenian genocide” is Googled.